So here’s what it’s all about – my new (but very old!) 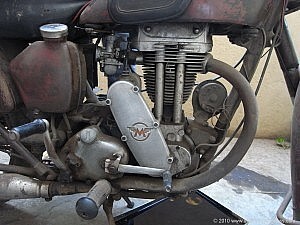 Matchless model G3LS motorcycle. What else can I say about it? Well, it was built in February 1951 (making it almost 60 years old) at the Matchless motorcycle factory in Plumstead, London in the UK. 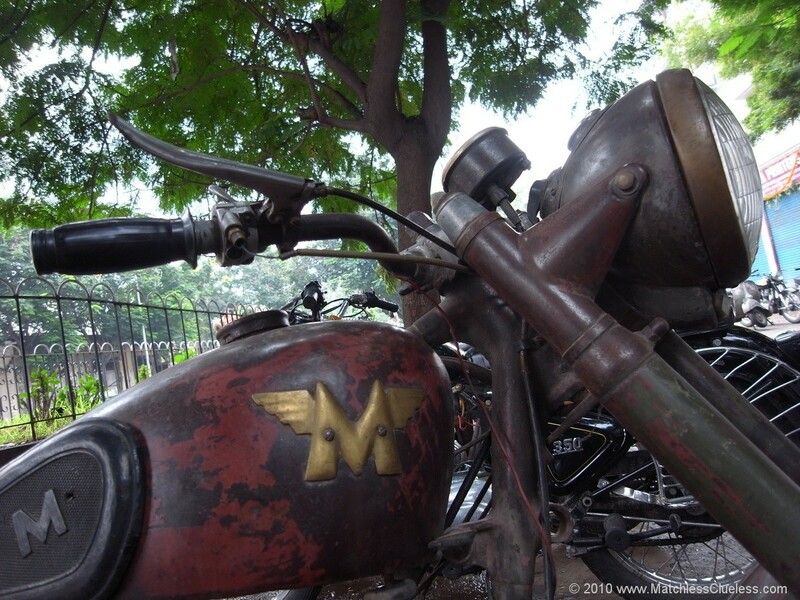 The bike was part of a consignment of around 400 machines which were sold to the Indian Army, and hence it’s current location here in Hyderabad, Central India. There are still remnants of the original khaki-green army paint job on some parts of the bike, especially in the more protected out-of-the-way areas such as under the tank and seat. The current colour scheme however looks more red, due to the combination of the red oxide undercoat and bare steel which have worn through over most of the surfaces. It gives the bike a very unique look which I very much like. I’m also told that the exhaust position above the right foot peg is another indication of it’s ex-military history (see bottom photo for close-up) – the exhaust is apparently below the foot peg on civilian models. The photo above was taken when I was first shown the bike a few months ago – check out the flat tyres, torn seat and grime-encrusted engine! It’s currently undergoing serving and some restoration, although I want to keep the overall look of the bike unchanged from what you see here. It would seem such a waste to paint over 60 years of history to “restore” the bike, but nevertheless some parts will need to be repaired or replaced to make the bike roadworthy again. So onto a bit more technical info on the bike for those who are interested. The engine is a 350cc (well actually 347cc to be exact) single cylinder unit with a stroke of 93mm and an original bore of 69mm. It looks like it has had a few new pistons in it’s time though as the new piston that has been fitted following the engine overhaul was a +0.060″ oversize! I wonder how many extra cc’s and bhp that gives me? The gearbox is separate to the engine on these bikes (connected via a chain drive) and is made by Burman. Apparently it’s usually referred to as a Burman “CP” type gearbox, as opposed to the “B52” type gearboxes fitted to these models from the following year (1952) onwards. The gear change is on the right-hand side and it has four gears; from neutral it’s up for 1st and then down for 2nd, 3rd and 4th. A bit confusing to start with if you’re more used to modern bikes, but after a few crunchy gear changes when you go to brake, and a few accidental emergency stops when you go to change gear, you get used to it. Starting the bike is also a bit of a challenge to the uninitiated, there’s no electric starter to begin with. Then there’s those three extra levers on the handlebars (in addition to the clutch and front brake levers) that you need to get your head around. Under the clutch lever on the left is a small decompression lever. This lifts the valves to release compression in the cylinder allowing you to more easily turn it over a few times before starting. It’s also used for stopping the engine since there is no ignition switch fitted. The other two levers are on top of the handlebars and are used for adjusting the air mixture (the choke) and the ignition timing. The owners manual gives a fantasticly poetic description of how these should be adjusted before and after starting, but the general approach in practice seems to be to have them somewhere in the middle and hope for the best! Other than that, the bike is fairly simple and straightforward with little in the way of electrical gadgetry. What little electrical items there are (by which I mean horn, headlamp and tail-light) are all 6 volt. It remains to see what light the headlamp actually manages to throw out on to the road when the restoration is finished, but judging by the comments of other 6 volt bikers, I don’t think night-time riding is going to become my new favourite hobby! There’s always the option of a 12 volt conversion I guess, but that just seems like cheating. Perhaps I’ll change my mind though after a few dark winter evenings, but for now, 6 volt it remains. Other than that, I’m not sure what else I can tell you really. Check out my main blog page here for the full story of my restoration of the bike with lots more info and photo’s that you might find interesting. I have also recently added various galleries of photo’s of the bike from the first time I saw it back in India, through it;s Indian restoration and on to life with it here in Hong Kong. You can find this gallery of photo’s here. Please also feel free to leave me your thoughts and comments below. like to know more about your bike. What exactly would you like to know? There’s a whole website of stuff here! Maybe check out the blog section or have a look at the various links down the right hand side of the page to see what sort of thing takes your interest. Hi ,bike looks great.i have recently bought a 1943 military g3l and have only just ridden it.chap I bought it off said you don’t need to adjust advance a retard much or choke. To improve the lighting, try adding an earthing wire directly back to the battery from each lampholder. This bypasses any resistances due to steering head bearings, dodgy joints etc. In fact if you replace the supply wires too, you may well find the 6V lights aren’t too bad… Worth considering anyway! Great site James. I stumbled on it while looking for a genuine Lucas taillight for my 55 G3LS. I, like you, enjoy my bikes original as it shows character and plenty of use. I am looking at getting some of your LEDs and incorporating some of your other lighting ideas onto my machines. Thanks! Beautiful motorcycle, well done on preserving the patina. I have a 1953 AJS 18S which is in the middle of restoration at the moment. I have a similar philosophy to yours, but decided to paint it after all just to arrest the corrosion here in the UK. I’m looking for exactly the kind of lock which you have stowed on the fork leg. Could you give me a tip where to get it from? Hi Steve. Thanks for the compliments regarding the patina; it gets mixed opinions but I still love its uniqueness! The Hong Kong humidity is starting to take its effect in some places, so I’m applying copious layers of wax to keep the rust from taking hold. Think another coat of clear lacquer will be in order soon. The lock on the front fork of my bike was bought in India where they were very common, but no idea where you would pick one up in the UK. It was quite handy to always have with you, but this particular example wasn’t very secure really – more of just a deterrent to stop the bike being wheeled away. I’ve now removed it and carry a big thick high security chain in my new top box instead. Hi John. I found my bike in India through the local mechanic who specialises in old bikes. It was a friend of a friend of someone he knew, or something along those lines. Can’t remember the exact details though. Your new displacement with .060″ is 363cc. (7.05 cm bore*2*pi*9.3cm stroke). Your low-end torque is probably increased in proportion to the displacement increase, just under 5%. Horsepower likely is unchanged, but peaks a few rpm lower due to the gas flow characteristics. I have a 1951 G3Ls in good running condition but main chain sprokets are worn out. I shall be grateful if most kindly let me know thet where i can procure the parts to keep my lovely bike on road. 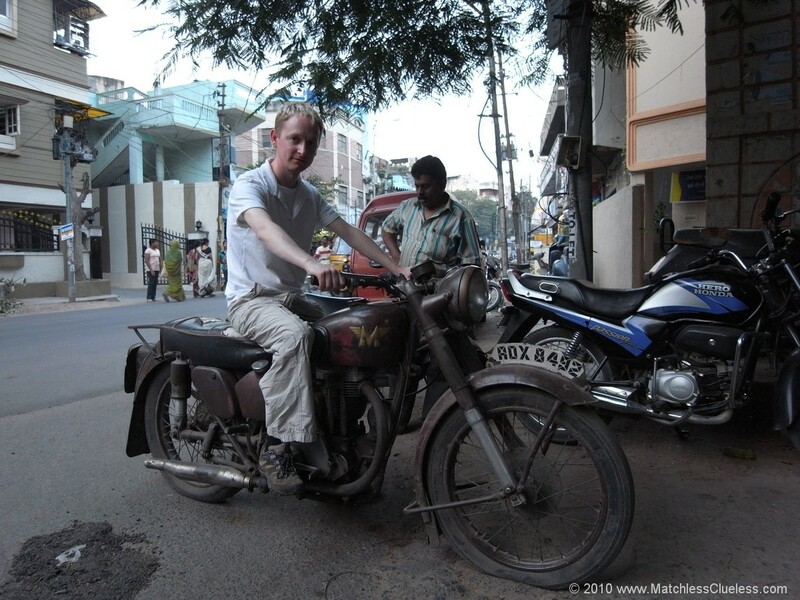 Could you suggest any specialist garage in Kolkata for matchless G3 ls please? Any advice would be much appreciated . I had a ’53 G3L, reassembled from a pile of rusty junk in the early ’80s. This was the last of the civillian G3Ls and could be converted to G3LS, which I did. Did you know that the ‘L’ refers to the aluminium cylinder head – L for light. The prevoius model had a cast iron head and was known as the G3 ? I loved the bike and rode all around West Yorkshire, but my wife hated it (wouldn’t ride and didn’t like me riding it – too dangerous ) so I sold it. A great pity. I have some photos that I will scan and post on the site. NB the registration number is USV 246 and the bike is still registered and taxed. Hi James, congratulations on this lovely acquisition. I am amtchy freak with a 41,49 and 52 G3Ls in my collection. Also own a BSA M20. Love the girder but no match to the build quality of the G3L. My bikes are back home in islamabad (Pakistan) but hardly driven because my jobs entails extensive travel from one devastated part of the world to the other. Yes, I am a humanitarian aid worker! Please do consider visiting pakistan one day. We do not have too many brit bikes remaining but you will be happy to meet with some of the enthusiasts out here. Do visit our facebook page pakistan vitange and classic motorcycles PVCMC. Best, Jack. 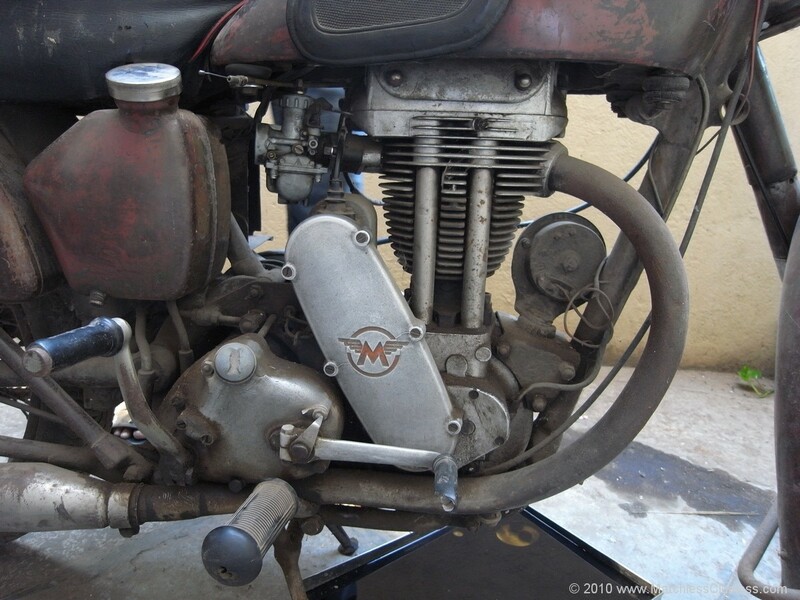 hey guys I have one matchless also and i was wondering if she’s able to do a 300km travel? what u think about? I’m Russ in the USA. I’m waiting in wild anticipation to purchase the Lucas 564 LED setup. (you have not had any for awile). I signed up for notification some time ago. The reason is: when I energize the rear brake at low rpm (such as when coming to a stop) the engine dies. You see I’m running the old battery-less/blue capacitor power system in a 1966 Triumph 650 and there simply is not enough power to fire the ignition when the rear incandescent brake light is on. The Led lamps here which insert into the standard lamp base, do not like the Lucas stator chopped up Voltage output and refuse to do anything at all, where-as an incandescent filament doesn’t care at all. I can barely wait to obtain one. I have a 1949 G3L Matchless 350cc black and its a “farm rat” all rusty patina!!! I love the rat look as its original and real, and shows all the years. No way I am touching it. It goes and does the job for me, plus its a screamer as loud as it can be!! !